I’m a cycling geek. I love it: the romance of the road; the century of history; the epic duels; the famous climbs. It’s a sport not without its scandals but still markedly different from the world of primadonna footballers with fans shelling out hundreds of pounds just to watch a match. I’m also a journalism geek. I work for a newspaper and have been interested in publishing and writing since I was a kid. Similarly, it’s an industry that’s been in the spotlight lately for all the wrong reasons. I’d like to explore the perhaps surprising parallels between these two seemingly-unrelated worlds. Cycling has already had its day, if you believe the cynics and traditionalists. 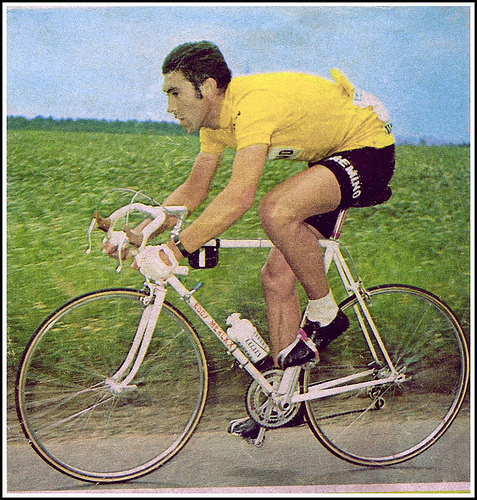 The Tour de France, cycling’s grand spectacle, used to be much harder than it is today, with average distances almost a thousand miles longer than the current race length back in the 1960s. Riders back then couldn’t rely on in-ear radios and mics with constant feedback from their support teams: they had to read the race tactically and respond with bravery, panache and judgement, rather than be told when to make their move. Equipment was less complex, with things like skinsuits, aerodynamic helmets (or even helmets altogether) and tri-bars yet to be dreamed up for use on the road. Cycling has been infamous of late for its doping stories: Lance Armstrong’s fall from grace is well-documented and other riders have suffered less mainstream but equally dramatic public exposures in the past. Some parts of the cycling community still regard all professional riders as cheats through-and-through, casting suspicion on any successful rider who claims to be “clean”. New and advanced techniques for escaping the eyes of the drug control testers are constantly appearing, with evidence that it’s been going on for years unchecked. Journalism too has been airing its dirty laundry in public: phone hacking and its subsequent media farce has uncomfortable parallels with the Armstrong story: dozens of lackeys forced under the bus to hide the affairs of the senior figures; televised courtroom confessionals; the closure of publications (just as cycling teams were left without sponsors or equipment). A public who used to think only politicians were “all liars” now think the same of journalists, too. Seedy back-room collaborations with officials were rife in both worlds and laws set up to attempt to govern the misdeeds were quickly derided as toothless and irrelevant. 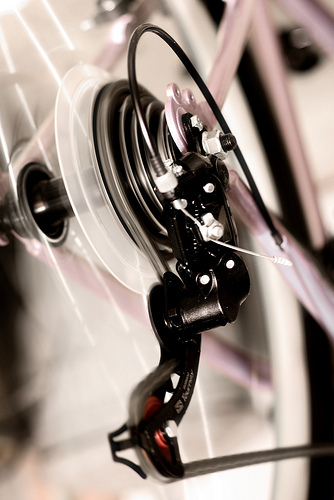 As manufacturing and digital tech develops, cycling has changed dramatically: the rulemakers have to enforce arbitrary weight limits on ever-more-lightweight bike frames, and teams increasingly dominate through their mastery of data and communications. 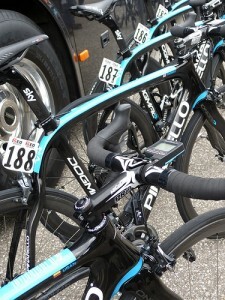 Team Sky (already helping make the link between the worlds of cycling and journalism more explicit) have been criticised for their dominance of the sport but reliance on data to win races, with bitter rivals complaining that they’re not riding in the spirit of the race, but instead focusing more on their power meters than their competitors’ legs. Likewise, journalism has been shaken by the arrival of new tech, with the more canny organisations quickly cottoning on to the best ways to attract eyeballs to their content. The cynical manipulations of SEO and linkbaiting aren’t worlds apart from the rider with both eyes on his power meter, knowing exactly what numbers he has to hit to climb the mountain the quickest. Increasingly, the news organisations stubbornly sticking with print and insisting those who innovate digitally are digging themselves into a hole are becoming harder to take seriously. In both industries, the wheels keep spinning (if you’ll pardon the pun). Cycling has had its watershed moment: riders are more conscious than ever that they’re in the public eye and they’re less able to get away with cheating. Similarly, journalists are more exposed than ever, with an audience frequently reminding them that they’re under scrutiny and potentially replaceable. Cycling used to be a peasant’s sport, but now the best teams are the richest teams with the strongest commitment to data and analysis. That might not always be the case. In a stage race like the Tour, teams with a strong squad like Sky can dominate by sheer force of strength, but all it takes is a rouleur like Jens Voigt to blaze ahead and disrupt everything, adding a dash of excitement to proceedings and underscoring the point that ultimately, pro cycling is about courage, grit and showmanship. Journalism, then, is at risk of becoming dominated by the numbers game too. In a climate where profits and losses are more crucial than ever, it’s tempting to dump the non-commercial sections and prioritise “viral” content to max out on monthly uniques. This won’t prevent a flyaway blogger or disruptive newcomer from stirring things up, though, and nor should it. It’s also key to recognise that nostalgia is a fool’s errand. 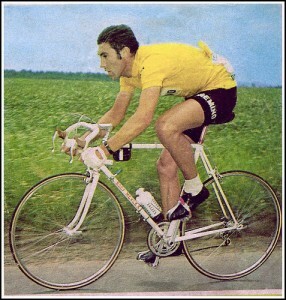 Riders in the days of Simpson and Merckx were doping too, albeit without today’s sophistication. Advances in equipment shouldn’t be ignored: they aren’t racing in a vacuum. Likewise journalists harking back to the glory days of print and sounding off about the internet “killing journalism” need to look at the bigger picture again. The best stages of the Tour are the mountains: the sheer, grinding effort; the constant possibility that a leading contender might cave in and drop out of the race; the unpredictable young challengers rising up to overtake the seasoned pros. And after the climb comes the descent: not everyone can handle that relentless speed, either. But the ones who can: they’re the winners, it’s in their DNA. As journalists, we need to climb that mountain too, but we also need to be ready to move with speed and urgency when we’ve made it to the top if we want to pull on the yellow jersey.